Hi guys! I am so excited to be back and will soon try to get back to my regular blogging schedule (whatever that was!) Ha! I appreciate you hanging around during our family’s move over the last month. 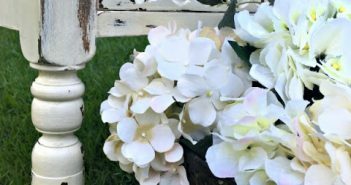 Thank you so so much to the bloggers that volunteered to take over my Blog for the past month. I think they did such a fantastic job and really appreciate them stepping in while I was super crazy! 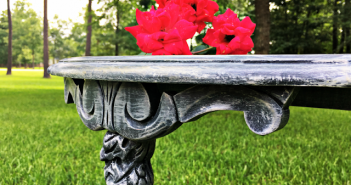 Now the kids are full swing into summer and the Texas temperatures are rising rapidly! Lots of water play, movies and wine sweet tea sippin’ on the back porch. Life is truly good right now! 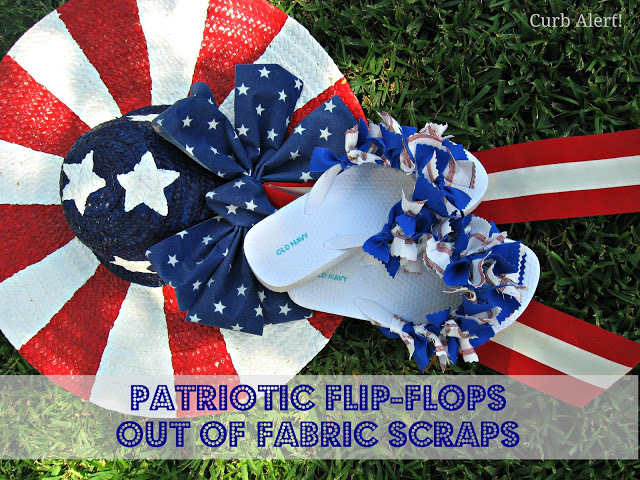 Patriotic Flip Flops out of Fabric Scraps! 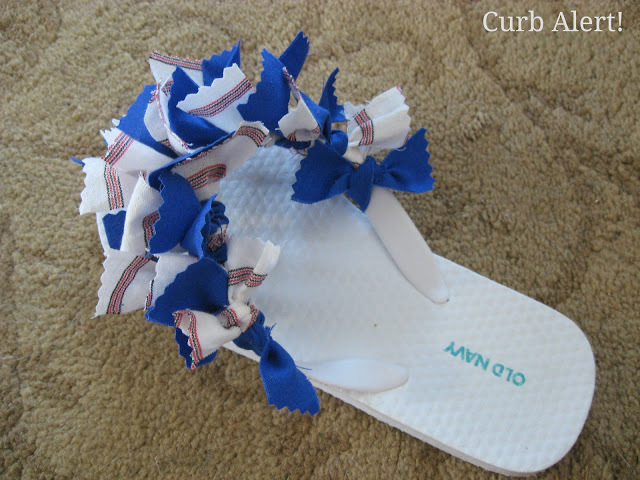 My daughter made these last year and wore them for the fourth of July. They were a big hit and so easy to make! Hello! 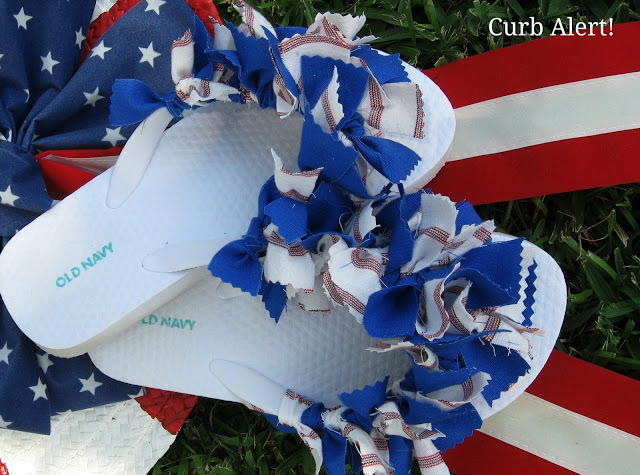 Can you believe it is almost the Fourth of July? Summer is just speeding bye! 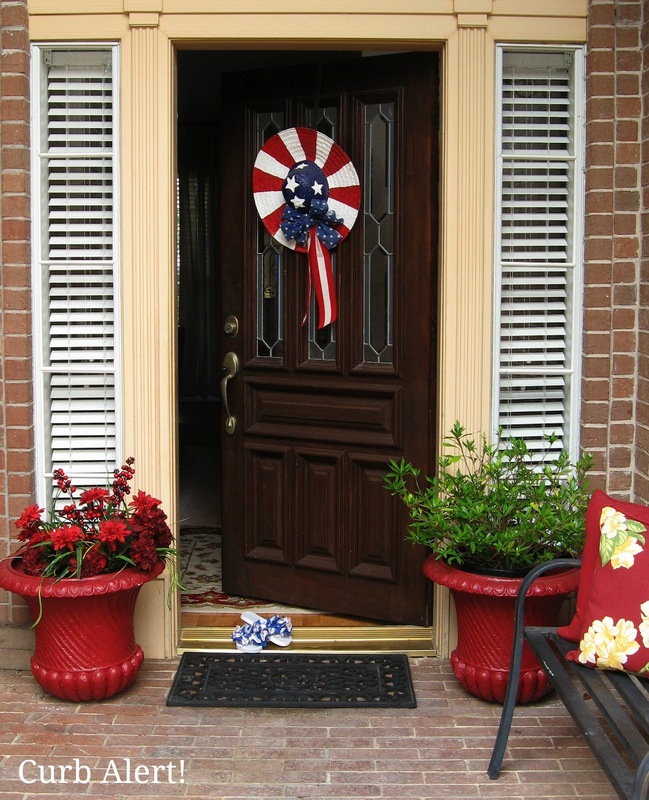 I have been begging, pleading, bribing my family to try to wear coordinating red, white and blue for the fourth but as usual no one wants to get on board. A mom can dream, right? They have all agreed to be matchy-matchy with mom so who cares if they wear purple and green in their wardrobe on the fourth, they will at least be stylin’ patriotic with their shoes, right? Would you like to know how simple it is to make them? It’s over 100 degrees here today so why don’t you come on in and let’s make some together! 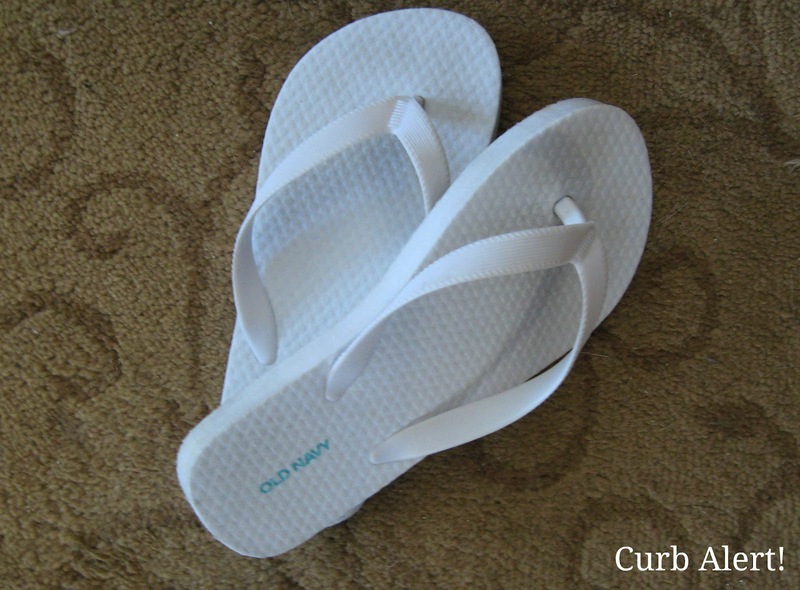 Be sure and bring some cheap flip flops to get you started, these we found at Old Navy for $2.50. I have also found some similar at the Dollar Store for $1. 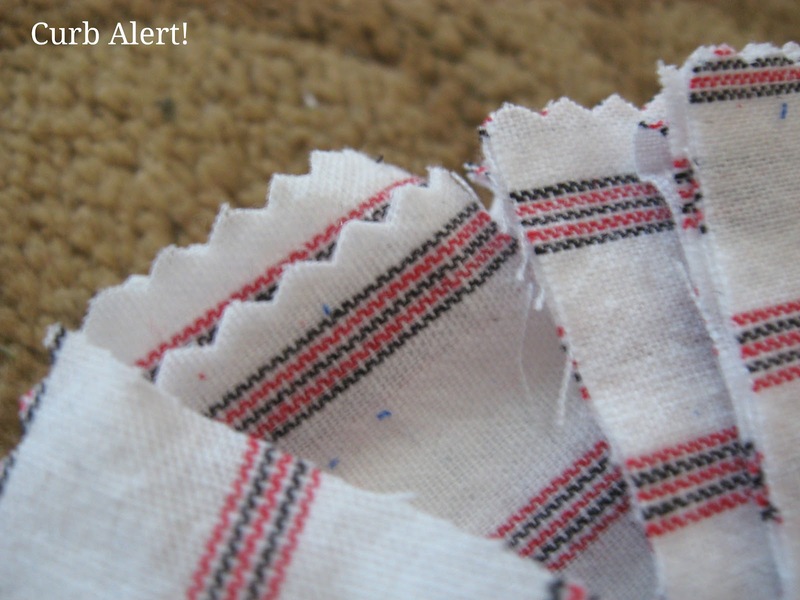 Now cut your fabric scraps into 1″ by 6″ strips. Don’t worry, it doesn’t have to be exact. 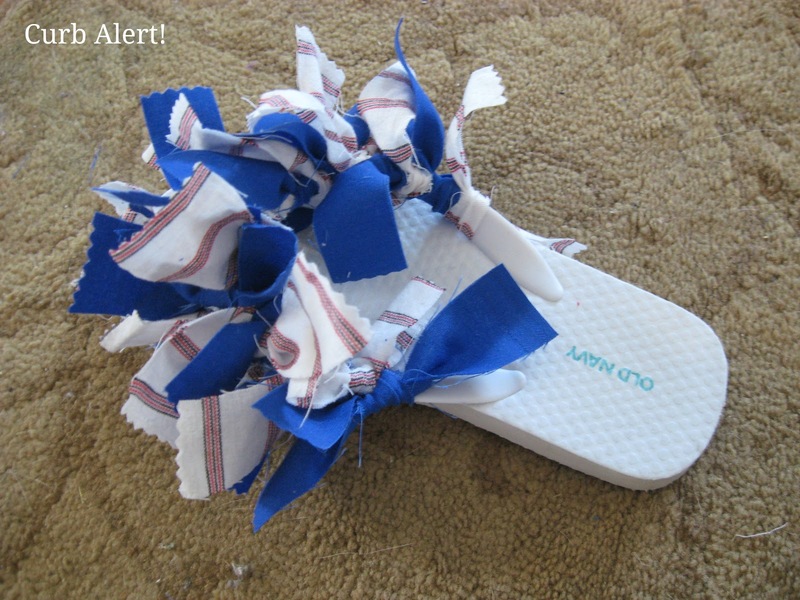 You will need about 30 strips per adult sized shoe and like in my sample here, use about 15-20 per shoe (youth size 1). I used pinking shears on the ends but you can use straight scissors if you prefer. We will probably cut them down a bit so it really doesn’t matter. A little fraying may also occur but that only adds to the cuteness! 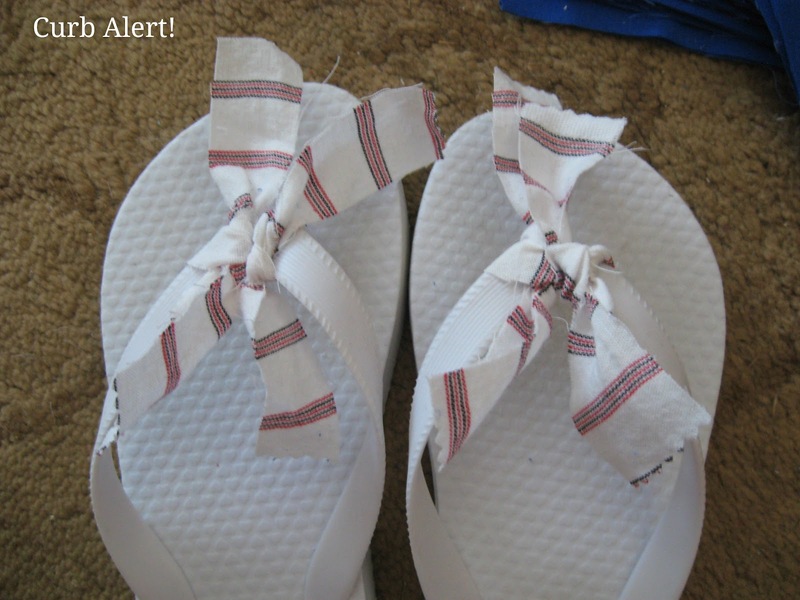 Now tie your strips onto the flip flops (only one knot needed) and switching the fabric as you go along. I started at the toe area just because I think it’s easier to start there. 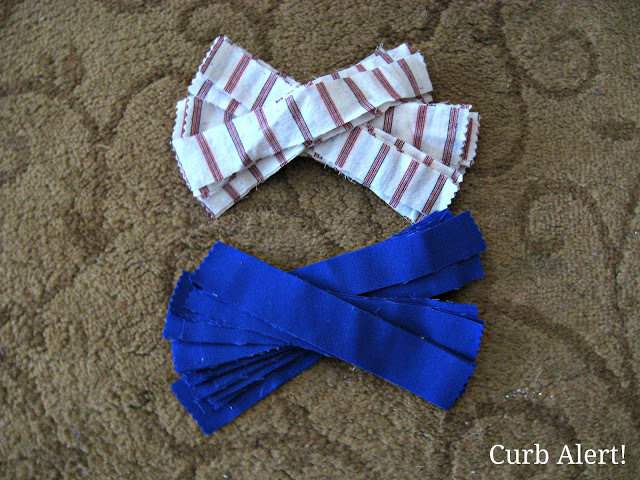 Also scrunch up the tied fabric pushing the strips tightly together as you go to ensure you can make it full. Got it so far? 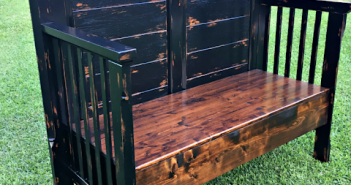 So easy and you will see that it’s super quick to complete! See how messy it looks. Easy fix! Just trim off the edges to your preferred length with pinking shears. See how much better now? 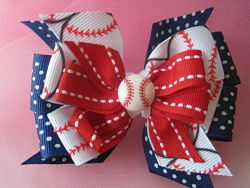 This fabric kind of reminds me of baseball!!! 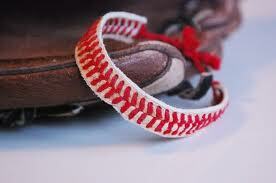 How cute would it be to wear these with some other baseball inspired accessories? Back to the Patriotic Flip Flops!!! Now off to the fabric store so my girls can pick out their own prints. 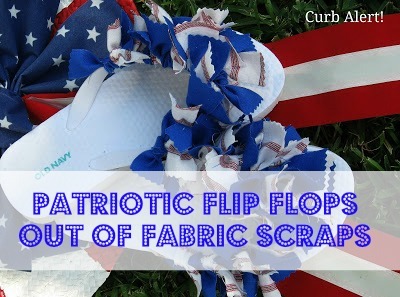 You should try it – just in time for July 4th! Think about all of the other fun holidays you could make them for. 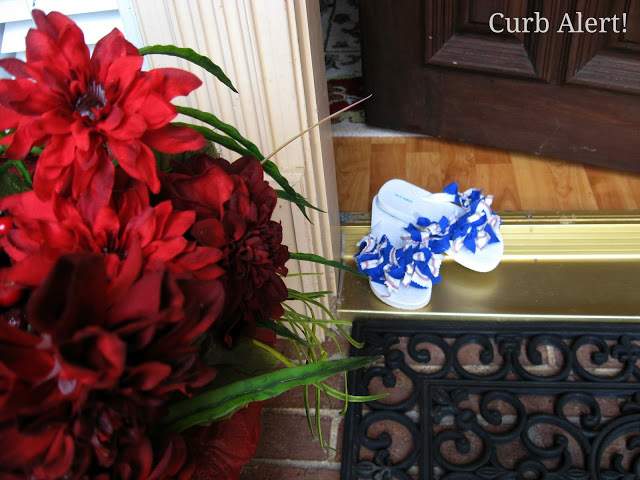 Thanks for visiting Curb Alert! what a cute idea, will share with my Grandaughter, she'd love to make these !. Glad you all moved in and enjoying your new place, glad your back !!!! This is such a cute idea! Thanks for linking up at our Yankee Doodle party. I've pinned this to my Red, White and Blue board!